Summary: Ninety-five days, and then I’ll be safe. I wonder whether the procedure will hurt. I want to get it over with. It’s hard to be patient. It’s hard not to be afraid while I’m still uncured, though so far the deliria hasn’t touched me yet. Still, I worry. They say that in the old days, love drove people to madness. The deadliest of all deadly things: It kills you both when you have it and when you don’t [x]. I picked up this book yesterday as I have been meaning to pick it up for a while. About twenty four hours later I have finished Delirium and I have this faint feeling of disappointment. Don’t get me wrong. I enjoyed the idea of the concept. I did enjoy the book but, their were few moments that shocked and awed me. The beginning of the book felt very slow to me. I know that the author has to build up this world but I felt it could have been in a shorter amount of time. Then all of a sudden the lI picked up this book yesterday as I have been meaning to pick it up for a while. About twenty four hours later I have finished Delirium and I have this faint feeling of disappointment. Don’t get me wrong. I enjoyed the idea of the concept. I did enjoy the book but, their were few moments that shocked and awed me. The beginning of the book felt very slow to me. I know that the author has to build up this world but I felt it could have been in a shorter amount of time. Then all of a sudden the last 50 pages of the book are fast-paced. The book was an okay fast read but I don’t get the emotion that came with it that others had had. I see reviews of people saying they weren’t prepared and they balled their eyes out. I felt none of those emotions when reading (okay, maybe when the dog died). Lauren Oliver’s writing is beautiful but it just didn’t give me that extra umph of emotion. The imagery on the other hand was fantastic! The characters were great! The description of the landscape was realistic. It actually felt like a town and I could visualize the buildings and the beaches. I don’t know. Overall, Lauren Oliver’s writing was amazing maybe the whole concept of the book just wasn’t. I will however read the second book in the series as sometimes books get better as the trilogy goes on (although I’ve heard that they don’t). (Read in 2014 – “2016 goal” is to try and finish this series). 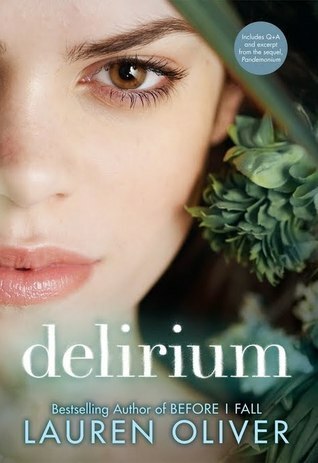 This entry was posted in book, book review, book reviews, books, delirium series, lauren oliver, review, series. Bookmark the permalink.